Wheeler has a graceful way with the petals and fronds of her imaginary landscape but a harder time with the logic and metaphor of the story. 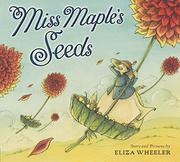 Miss Maple lives in a cozy home in a tree with a winding staircase that leads to her door. She rides on a blue bird, traveling all summer to rescue “orphan seeds that got lost during the spring planting.” She brings them home and scrubs them clean before taking them on field trips so they can learn how to live in proper soil and avoid weeds. All the while, she repeats the refrain that “the world is big and you are small.” She tucks them up all winter and tells them stories; in the spring, she sends them off with love and then starts all over again. The pictures are green, gold, peach and many shades of blue; Miss Maple herself wears voluminous layered skirts and a big willow hat. The plants and flowers invite repeated viewings. But if this is a fable for the care of lost little ones, the whole seed idea does not work. If it’s not, what is it?